I have had a few requests (well, 2, but i feel that any more than 1 request for this particular item is worth noting) for squids for birthdays. 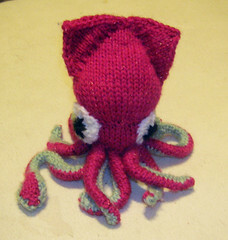 My friend nett put me on to hansi singh’s adorable squid-a-licious pattern asking me to knit her one in colours of my choosing for her birthday present. 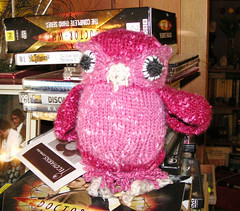 She bought me the pattern and a handful of others as my own belated birthday present, so it only seemed fair! So, I present Squidy the First! When i mentioned this request to another Gemini/Cancer cusper i know, she too requested one for her birthday present! 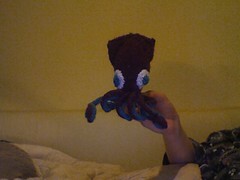 and so i present (apologies for the poor photo) Squidy the Second! it’s hard to see him, but he’s a maroon purple with green underside and green pupils. This is one of those times where i actually feel my first effort was the more successful of the two, but I do actually enjoy doing these! Things are starting to get going at my etsy site! I’ve purchased a showcase spot today (7th) and already someone has spotted one of my items and included it in this gorgeous purple themed treasury. 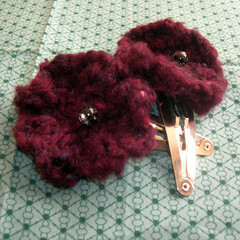 She’s also listed her treasury on her blog, so in return I’m linking back to her here! I also had my first completely random stranger sale on Friday night. 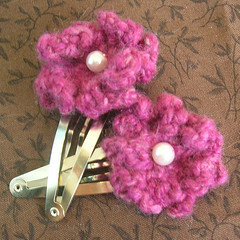 Some lovely person in India has purchased one of my first listings – my beaded pinboard pins – and my latest creations – knitted flower hair clips! I got Nicky Epstein’s Knitted Flowers a little while ago and I’ve been playing around with some left over yarn and her little patterns to create some of my favourite items yet. And they’re already becoming quite popular! 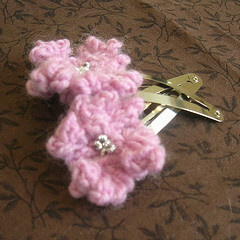 I’ve also knitted a gorgeous brooch which will be listed as soon as there’s enough light to take a decent photo. I’ve enjoyed playing around with the flowers so much that i’ve ordered her crochet flowers book too, since my crochet skills are improving all the time!